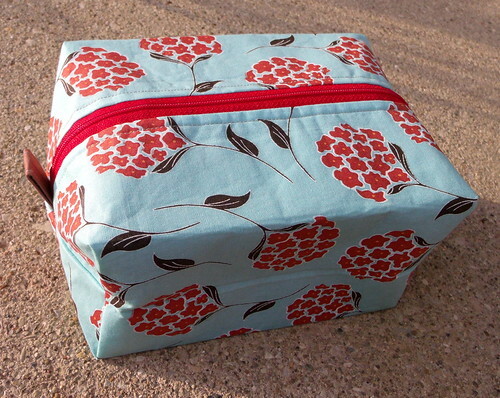 That boxy bag I made the other day was so much fun that I couldn’t resist making another one. I’m planning on giving this one to a friend. 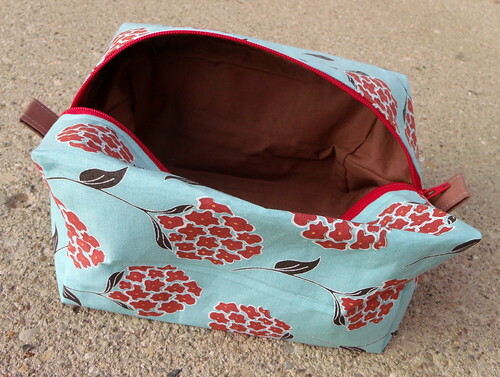 I couldn’t find a blue zipper that looked right with this fabric, so I picked up a red one instead. While I was making it, I was worried that the red zipper was too much, but now that it’s together I think it goes well. I’ve been procrastinating a little about starting the next block in the Skill Builder Sampler, which is a surveyor’s compass. I’ve been looking forward to doing this one, but a little nervous about it, too. I’ve been having trouble deciding what fabrics I want to use, but I think I’ve just about made up my mind and am about ready to get started on it.